The iPhone 8 and 8 Plus have a lot in common with last year’s iPhone 7, but a new processor, improved camera, wireless charging, and the iPad Pros’s True Tone display might be compelling reasons to upgrade again. There was speculation that today’s event would only yield an updated ‘s’ version of the iPhone 7 and 7 Plus, with minimal spec and feature bumps, as Apple has done with the past versions of the iPhone. But Cook and co. are skipping ahead to the iPhone 8 and 8 Plus, which each feature the same 4.7-inch (1,334 x 750 pixels) and 5.5-inch (1,920 x 1,080 pixels) LCD screens as the 7 and 7 Plus, but with the iPad Pro’s True Tone feature carried over to automatically adjust the colors on the screen depending on your surrounding lighting. The new versions of the iPhone look nearly identical to their predecessors, including the non-clickable Home button featuring Touch ID’s fingerprint sensor. But on the back of each device you’ll now find a full glass panel, like the iPhone 4 had, which facilitates the Qi wireless charging standard. That’s right, you can finally charge your iPhone by just plopping it down on the countless Qi-compatible wireless chargers already on the market. The color options include silver, space gray, and a new gold tint, so those worried about losing their bling option can breath a sigh of relief. One additional feature that’s not immediately obvious is the addition of an extra speaker near the earpiece on the top of the device, giving the iPhone 8 and 8 Plus full stereo sound. Inside the iPhone 8 and 8 Plus is Apple’s new A11 Bionic 64-bit processor, which features a Hexa-Core chipset similar to the A10X Fusion processor that can be found in the recent iPad Pros. Apple says two of the processor’s six cores will be dedicated to handling tasks requiring extreme processing power (think games, rendering and compressing video, etc.) while the other four will be dedicated to simpler tasks to improve efficiency and battery life. The A11 also features Apple’s first custom graphics chip, with three cores that will presumably be a big assist as new augmented reality tricks debut on the iPhone. The iPhone 7 had one of the best smartphone cameras available, and the 7 Plus introduced Apple’s Portrait mode which used the device’s wide and telephoto camera lenses to calculate depth and artificially defocus the background of photos. The iPhone 8 Plus further expands that functionality with a larger 12-megapixel camera sensor and a new Portrait Lighting mode that combines the smartphone’s flash and depth map to simulate studio lighting setups that don’t actually exist. Like the original Portrait Mode, Portrait Lighting probably won’t be perfect when scrutinized, but adjusting the lighting on someone’s face in real time sounds like an incredibly fun feature that the selfie-obsessed should adore. 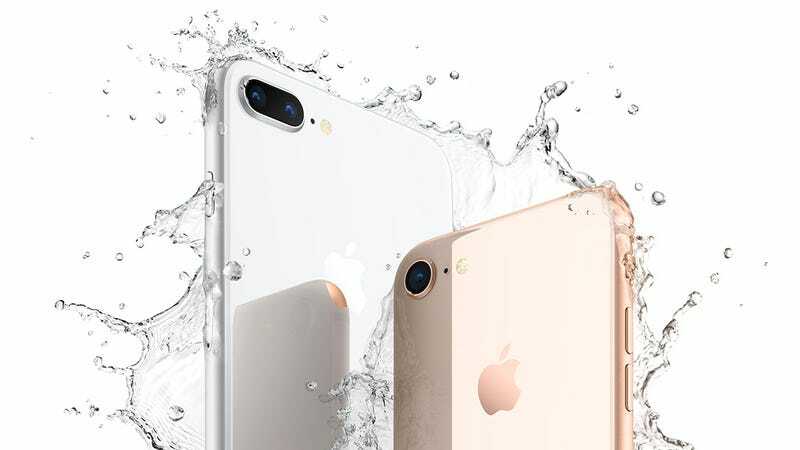 On the video side, the iPhone 8 and 8 Plus also boost high-speed video capture capabilities to 240 frames per second at 1080P HD, and a new Apple-designed hardware video encoder designed to reduce the times of renders, improve video quality, and reduce file sizes. So what’s it going to cost you this upgrade cycle? You’ll be able to pre-order the iPhone 8 and 8 Plus starting this Friday, September 15 for $699 for the 64GB base iPhone 8 (or $849 for 256GB), and $799 for the 64GB base iPhone 8 Plus (or $949 for 256GB). Are you going to upgrade to the iPhone 8, or the iPhone X?